Armament 10 x 8"/55, 4 x 5"/25, 6 x 21" tt. 4 Aircraft. Armor, 4" Belt, 2 1/2 Turrets, 1" Deck, 1 1/4 Conning Tower. Speed, 32.5 Knots, Crew 635. 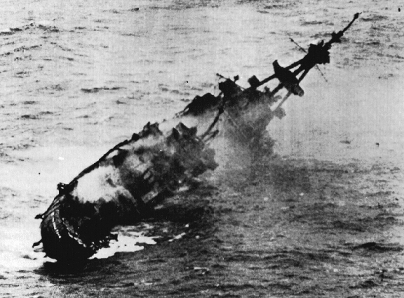 Fate: Sunk as target on 25 MAY 1948, 130 miles off the Southern California coast. 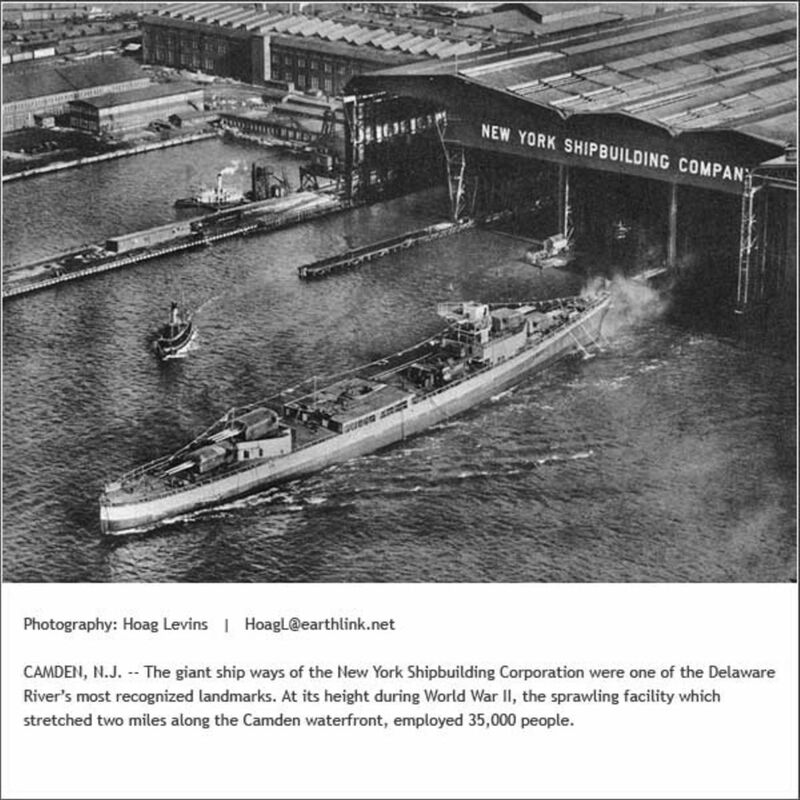 USS Salt Lake City fitting out at New York Shipbuilding, Camden NJ in March or April 1930. 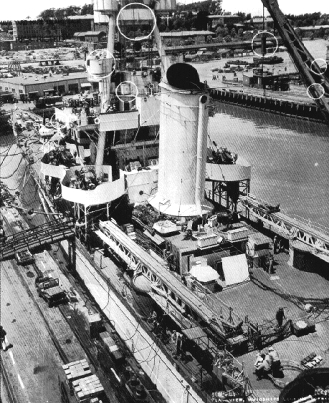 The ship at the bottom of the photo is USS Chester (CL 27). ISM Aero Service Collection #11925. Used for educational and non-commercial purposes. 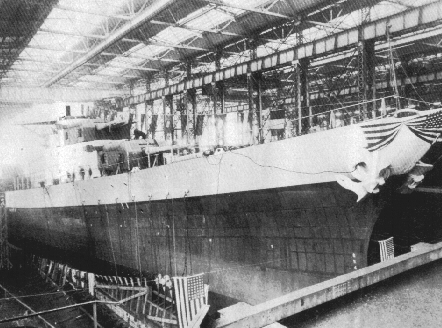 USS Salt Lake City (CA 25) in drydock at the Philadelphia Navy Yard on 21 October 1931. The ship is receiving scheduled repairs and upkeep. 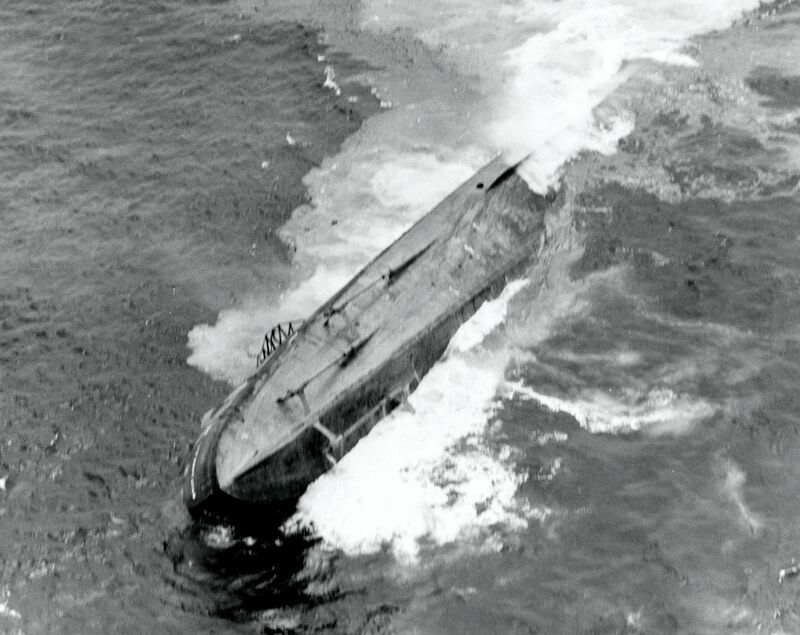 Note the men cleaning the hull below the waterline. Philadelphia Evening Bulletin, George D. McDowell Collection. No. P563146B. 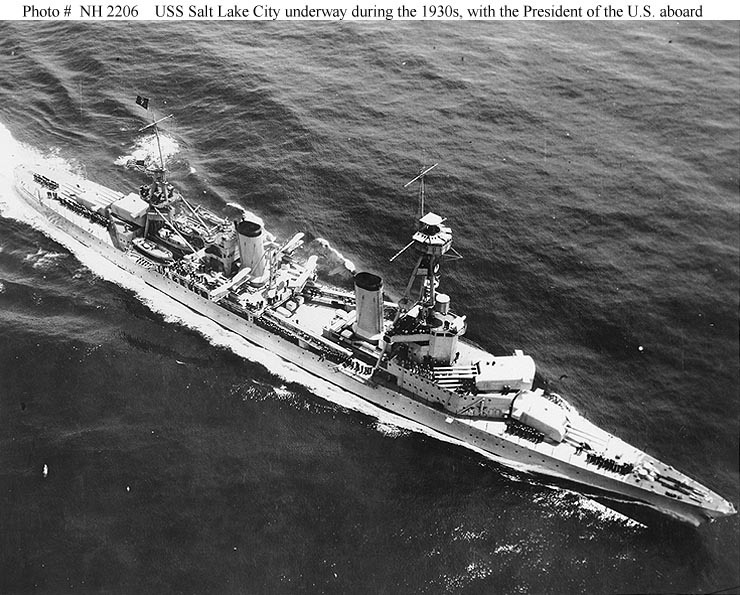 125k USS Salt Lake City (CA 25) underway during the early 1930s. She is flying the flag of the President of the United States at her mainmast peak. U.S. Naval Historical Center Photograph #NH 2206. 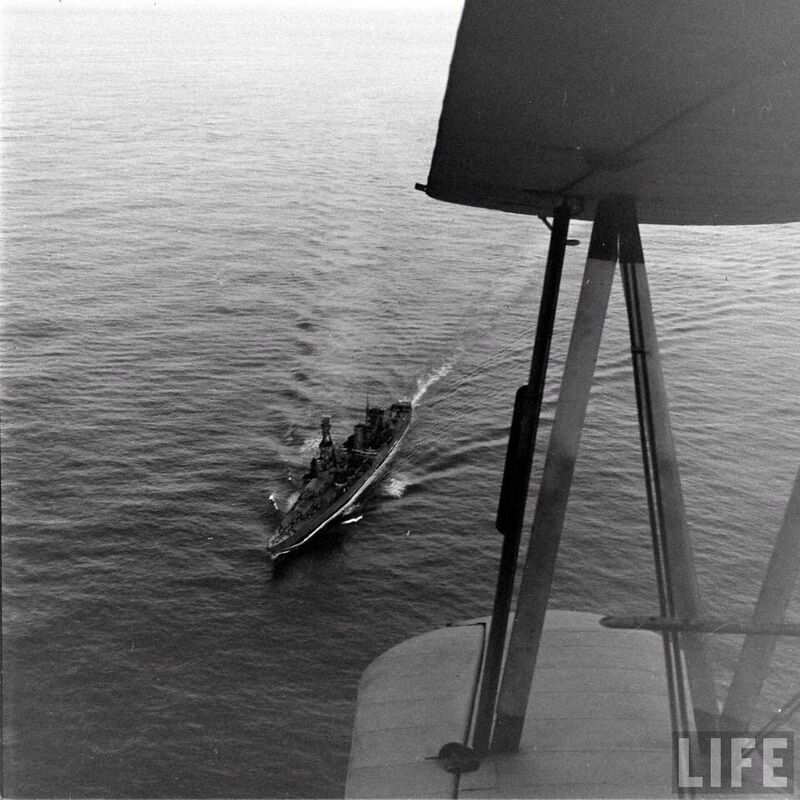 Over head underway, August 23 1935, Excellent detail shot. 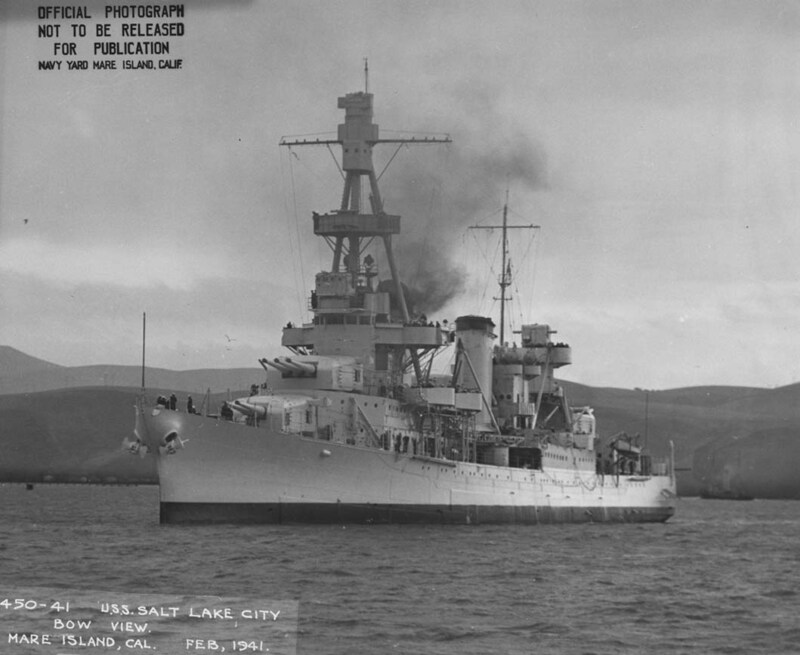 Portside view of Salt Lake City in Dress Ship while at anchor. 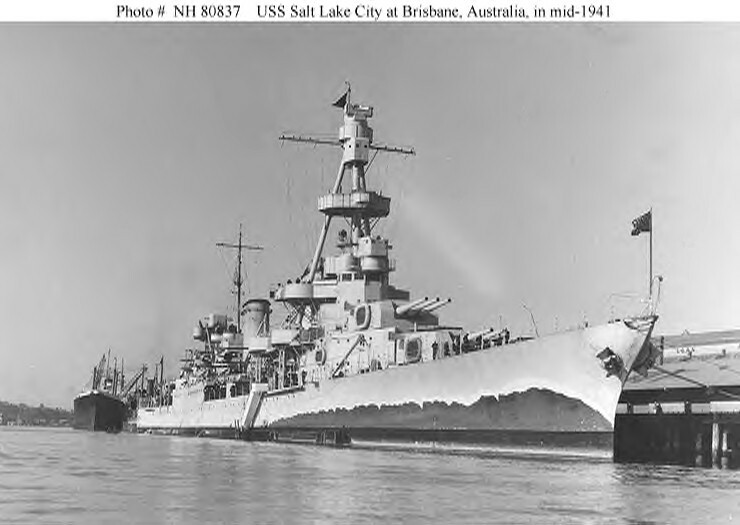 0402541 Starboard view of the USS Salt Lake City (CA 25) underway just prior to or just after the start of WW2. 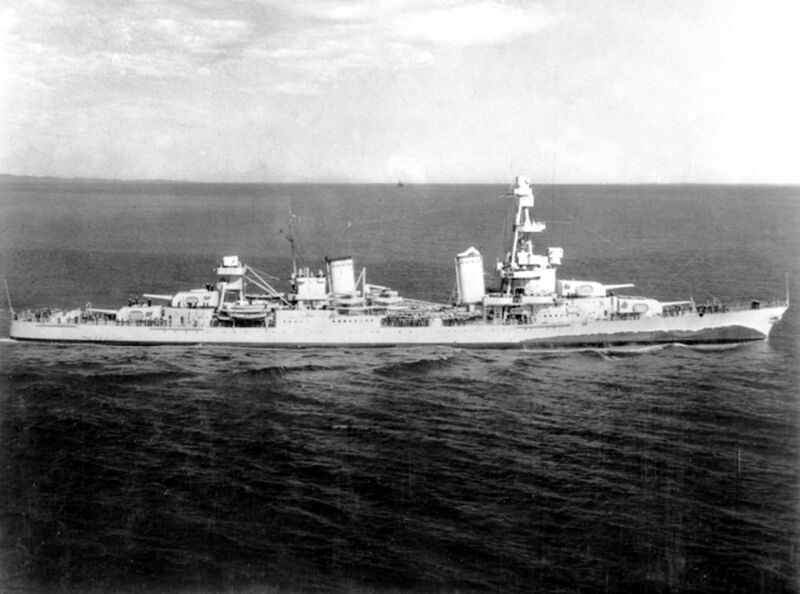 The ship, with no extra close in AA armament or radar added at this time, is camouflaged in Measure 3 light gray color scheme with a Measure 5 false bow wave. 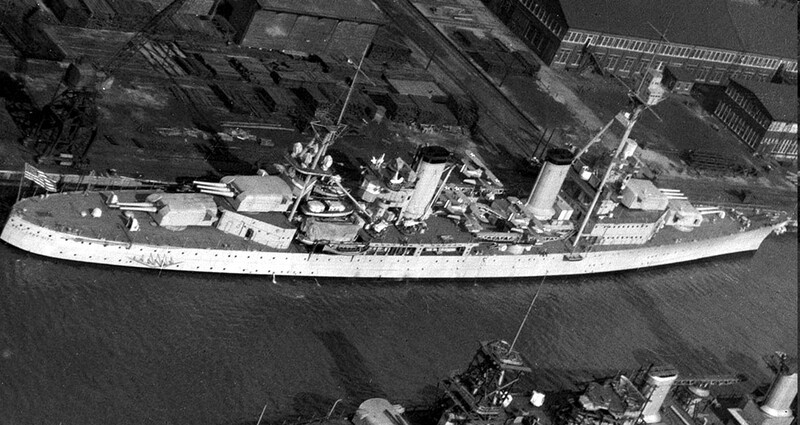 USS Salt Lake City (CA 25) at Brisbane, Australia, in mid-1941, while wearing "false-bow-wave" camouflage. U.S. Naval Historical Center Photograph #NH 80837. 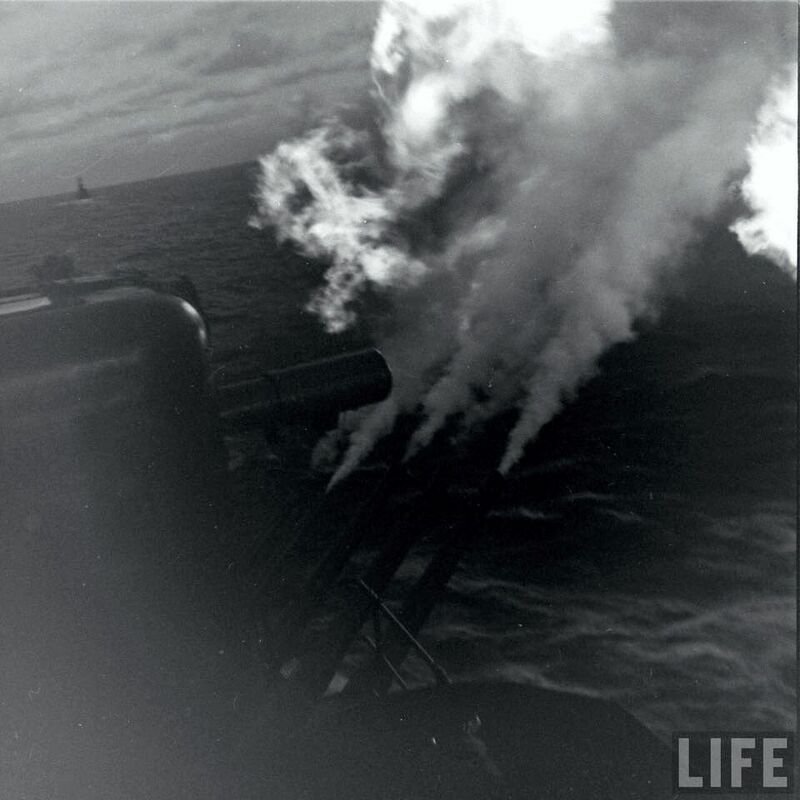 92k USS Salt Lake City (CA 25) fires her after 8"/55 guns while bombarding a Japanese-held island in February 1942. 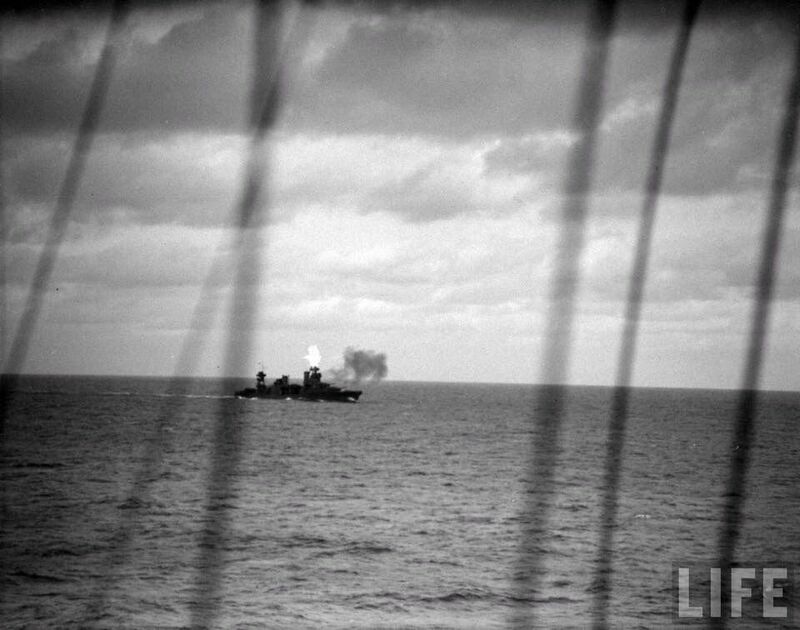 This view has long been identified has a scene from the 24 February bombardment of Wake. 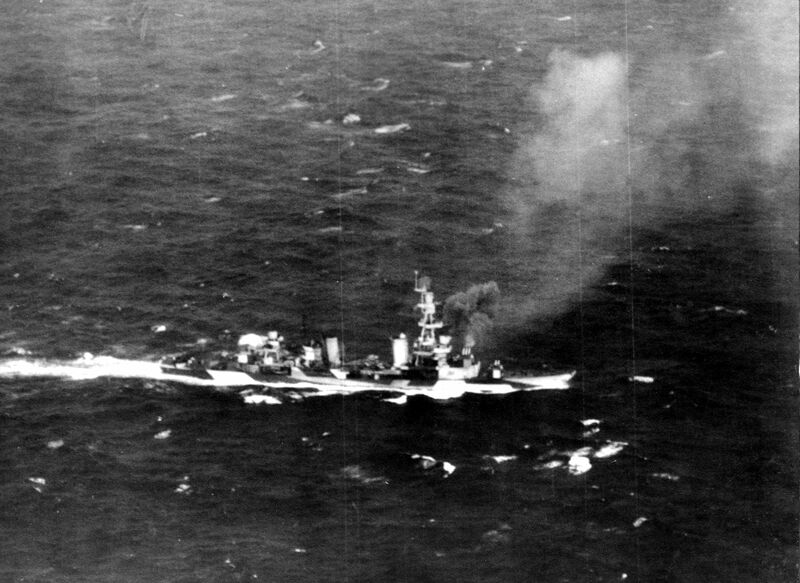 However, it may have been taken on 1 February, during the bombardment of Wotje, in the Marshall Islands. Note Curtiss SOC "Seagull" floatplane in the foreground, with the cruiser's after stack and aircraft crane immediately to the right. U.S. Naval Historical Center Photograph #NH 50946. 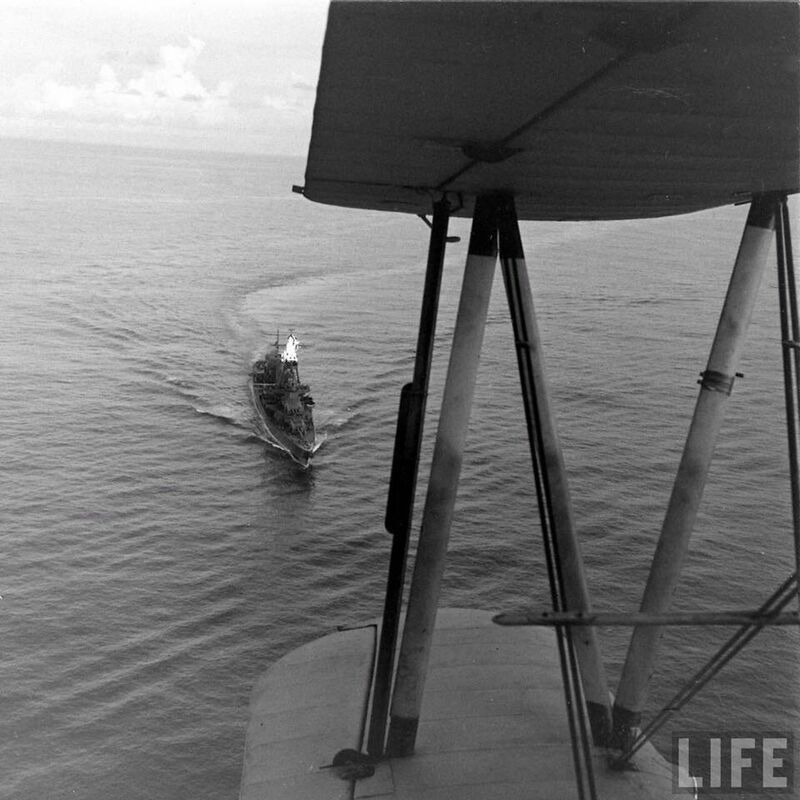 As seen from a cruiser observation plane, the USS Salt Lake City (CA 25) is underway, part of the Marshalls–Gilberts Islands Raids in February, 1942. 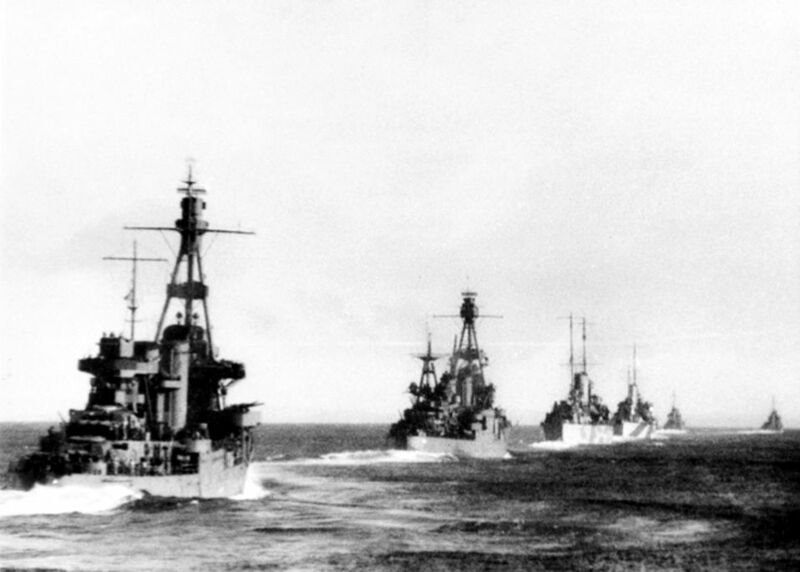 The cruiser, part of the USS Enterprise (CV 6) Task Force 8 screen, and along with other cruisers and destroyers also bombarded Wotje and Taroa. 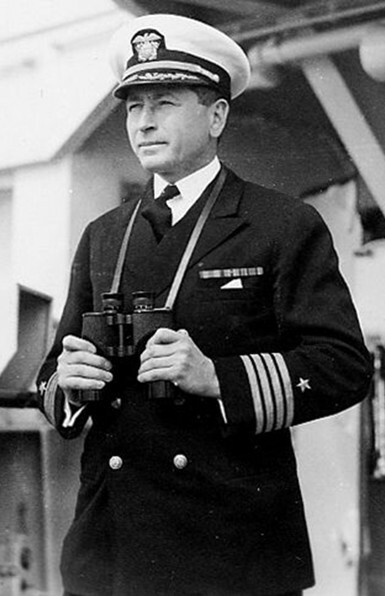 Note the Military Censor's attempt to remove the radar antenna from the photo. LIFE Magazine Archives - Bob Landry Photographer, shared by Peter DeForest. Looking forward from the aft stub superstructure on the starboard side of the USS Salt Lake City (CA 25). Easily seen here are 5”/25 open secondary mounts, catapult mounted SOC observation plane, ship's boats, aft funnel with search lights and the tripod foremast structure. 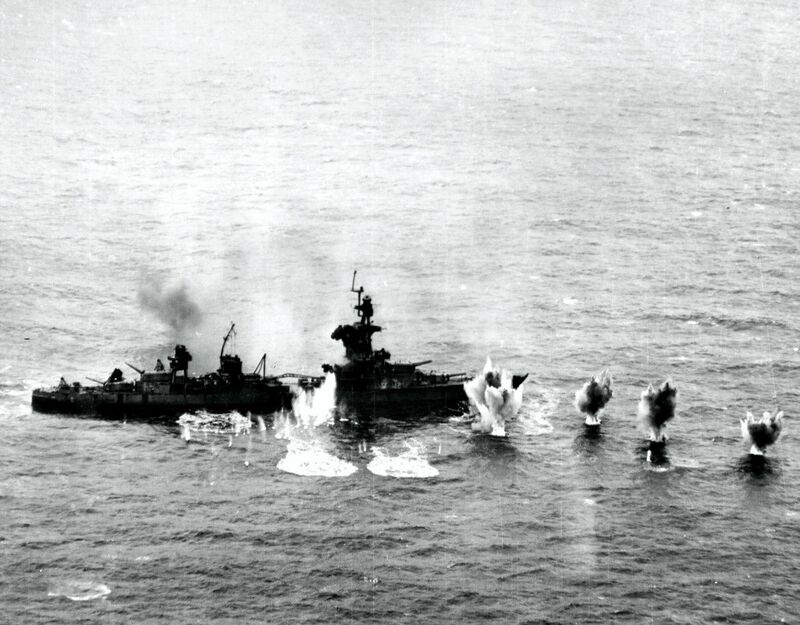 Looking aft, main 8”/55 guns firing to starboard during bombardment of Wotje or Taroa the Marshalls–Gilberts Islands Raids in February, 1942. 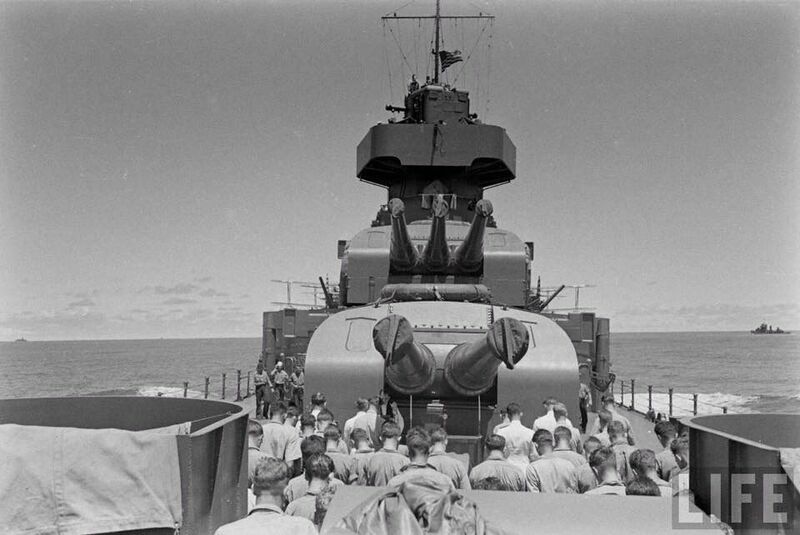 #4 twin 8”/55 turret overlooks church services on the USS Salt Lake City (CA 25) sometime during the Marshalls–Gilberts Islands Raids in February, 1942. 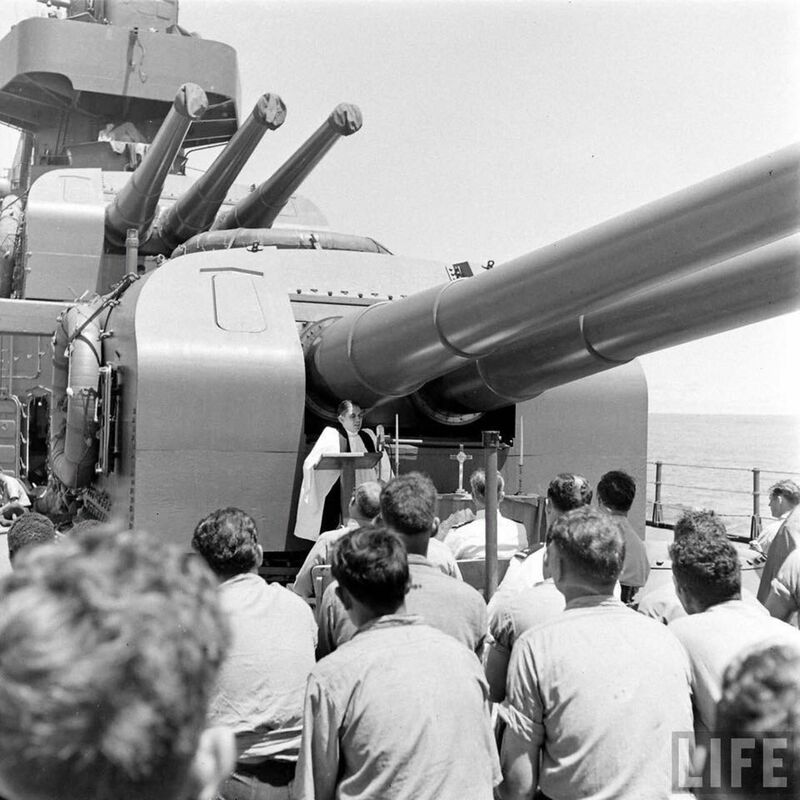 Crew receiving instructions or lessons at 5”/25 secondary mount on the USS Salt Lake City (CA 25). 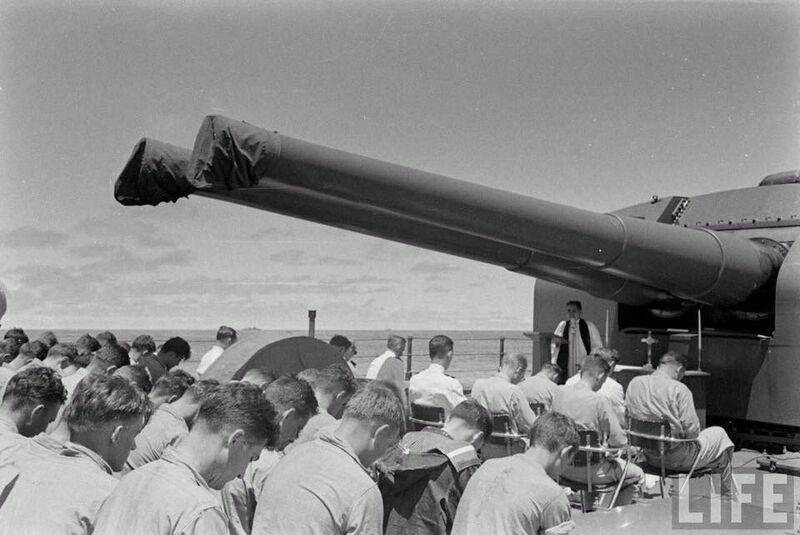 #4 twin 8”/55 turret overlooks church services on the USS Salt Lake City (CA 25) sometime during the Marshalls–Gilberts Islands Raids in February, 1942. 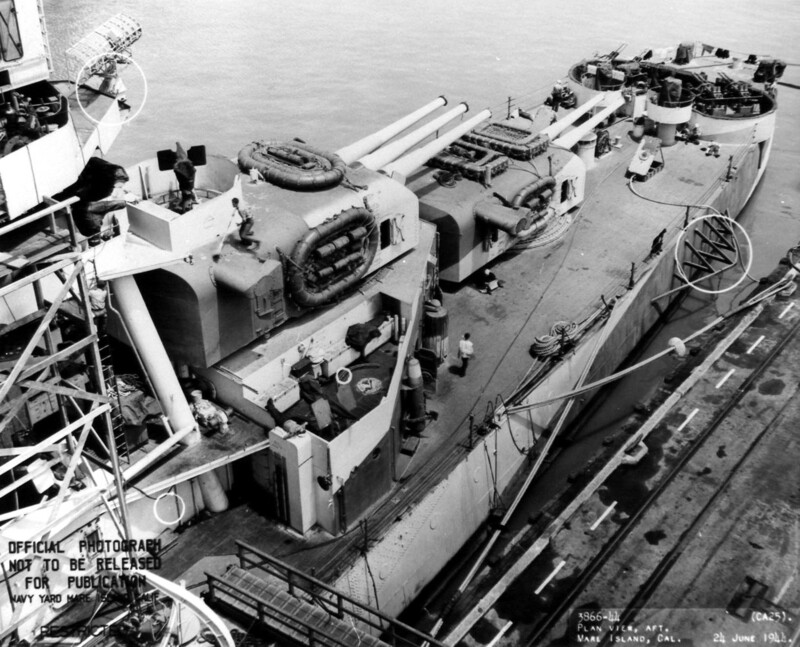 The unique 3 gun over 2 gun Pensacola class turret configuration is obvious in this photo. Flight operations aboard the USS Salt Lake City (CA 25). 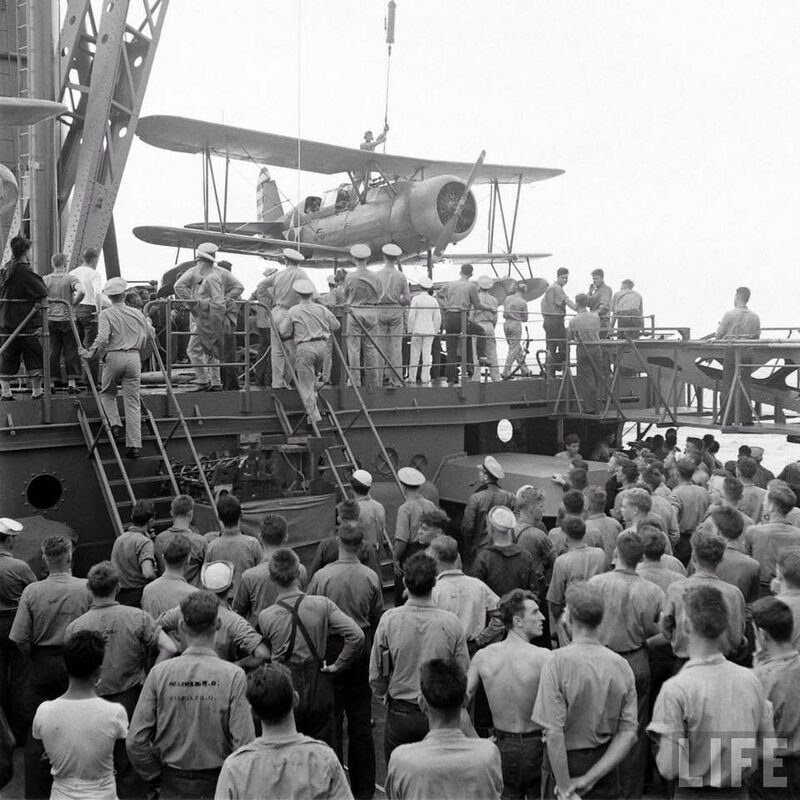 It appears that an SOC observation plane is being loaded onto a catapult after being recovered by the ship. 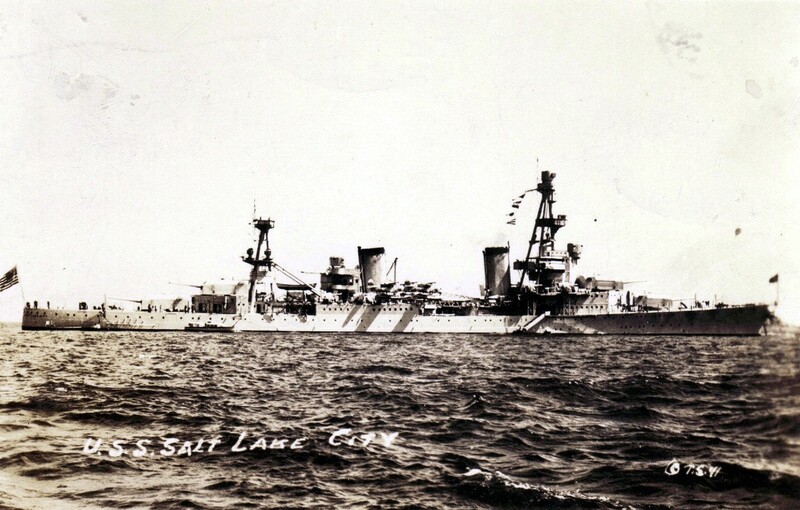 Stern view of USS Salt Lake City (CA 25) looking forward. 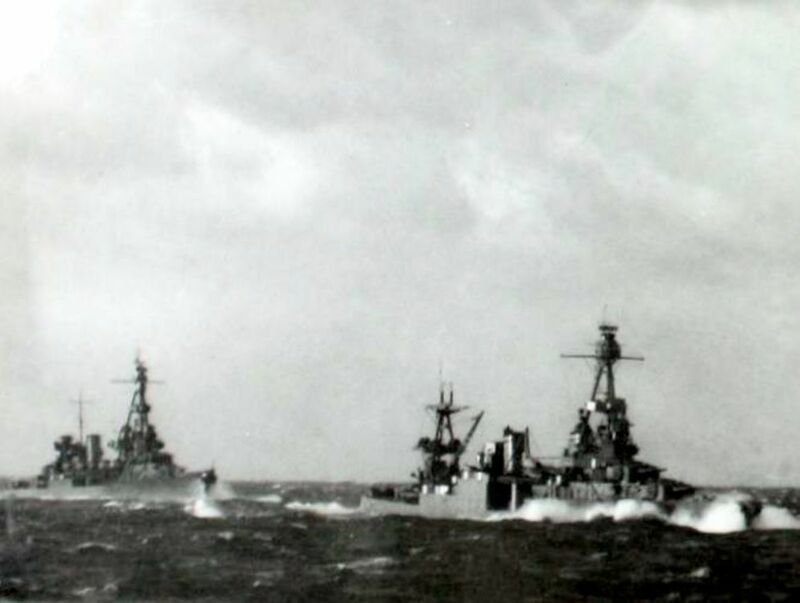 The unique 3 gun over 2 gun Pensacola class turret configuration is obvious in this photo. 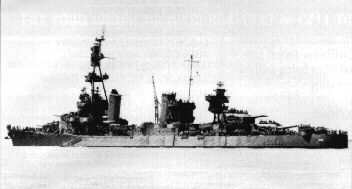 Starboard bow view of the USS Salt Lake City (CA-25) with main 8”/55 guns firing to port during bombardment of Wotje or Taroa the Marshalls–Gilberts Islands Raids in February, 1942. 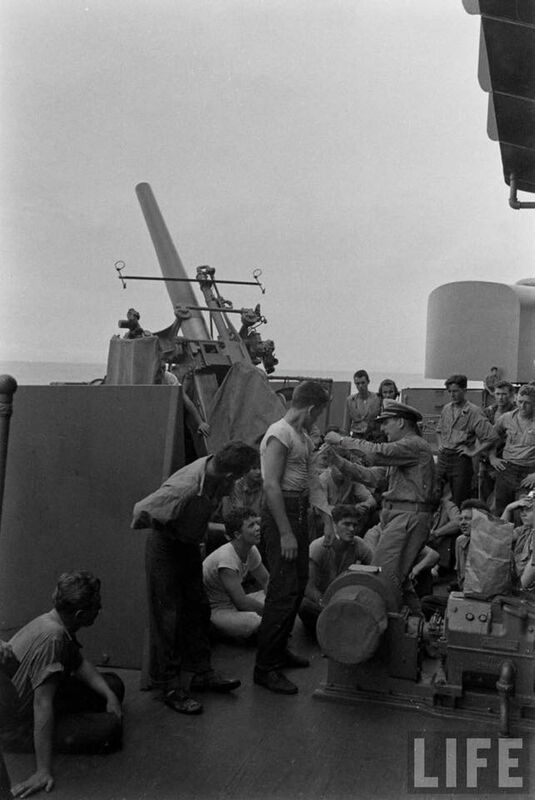 With the ship underway, the crew of the USS Salt Lake City (CA 25) are in whites listening to the ship's officers. A good detail shot of the ship's midship aircraft handling facilities and aft secondary gun configuration. Starboard side of the ship looking aft to the port side. 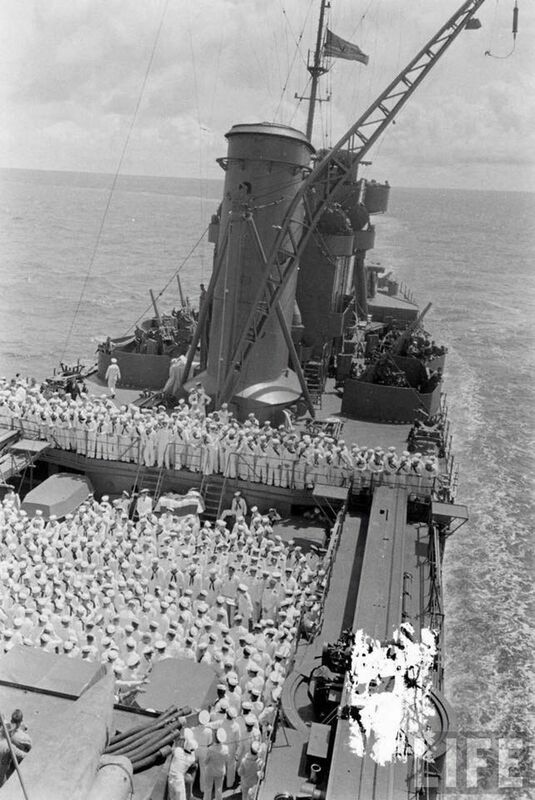 The crew of the USS Salt Lake City (CA 25) are in whites listening to the ship's officers. A good detail shot of the ship's midship aircraft catapults and aft secondary gun configuration. 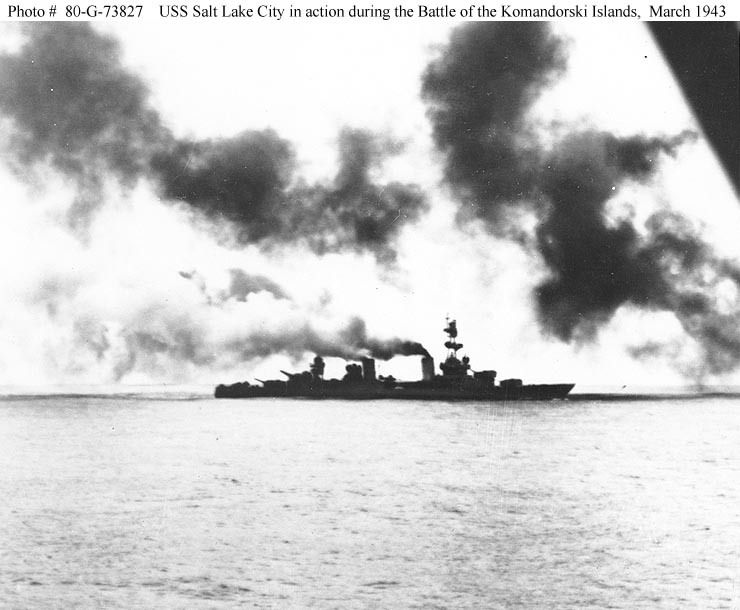 Battle of the Komandorski Islands, 26 March 1943. 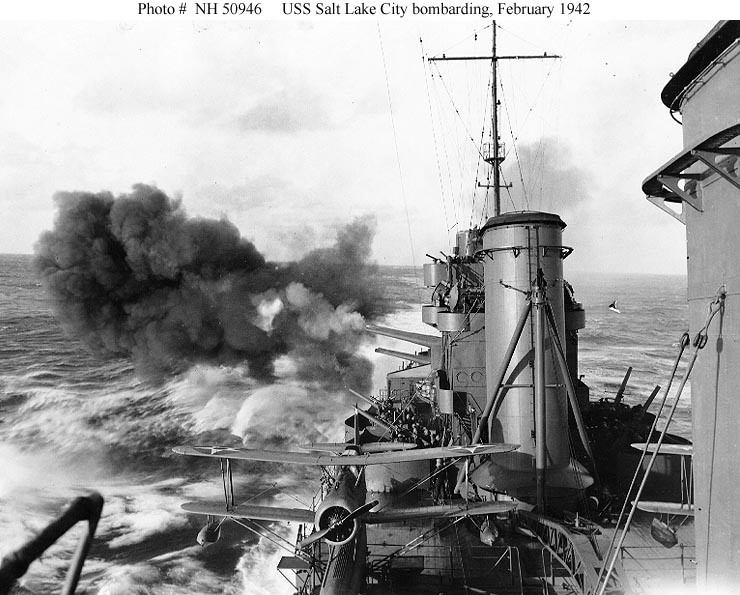 USS Salt Lake City (CA 25) in action during the battle, with an enemy salvo landing astern. 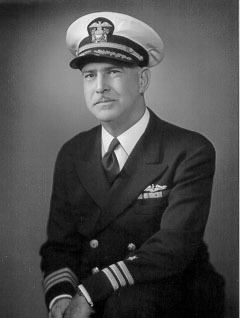 Official U.S. Navy Photograph, now in the collections of the National Archives #80-G-73827. 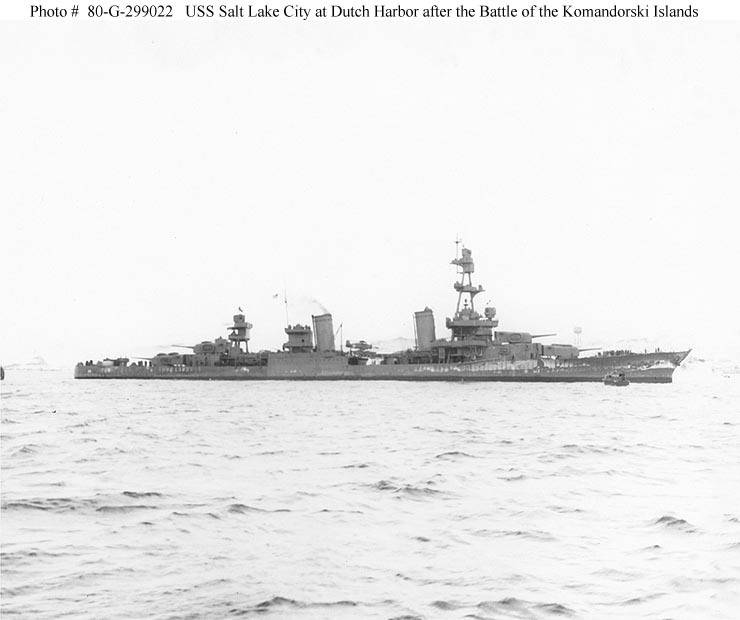 67k USS Salt Lake City (CA 25) at Dutch Harbor, Alaska, on 29 March 1943, three days after she participated in the Battle of the Komandorski Islands. 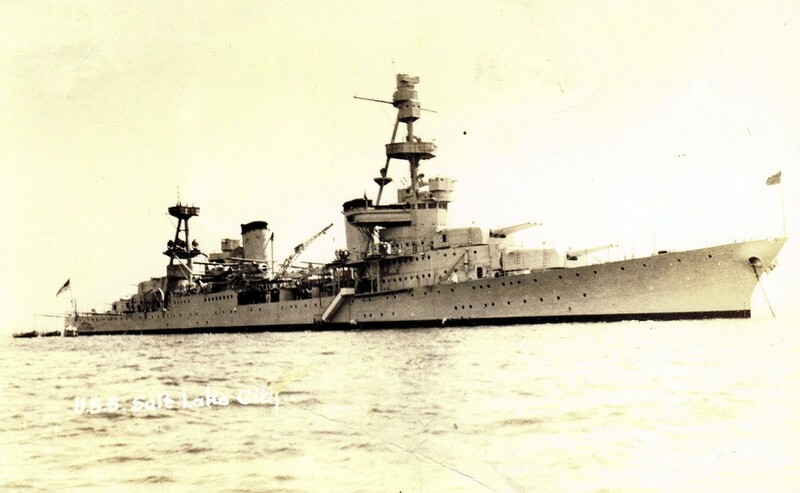 Note staining on her hull side, possibly from ice. 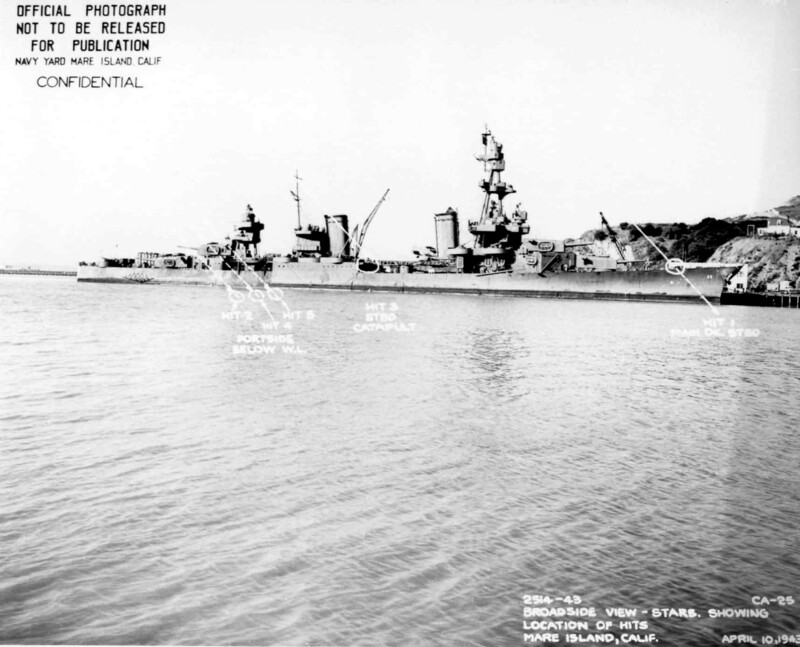 Official U.S. Navy Photograph, now in the collections of the National Archives #80-G-299022. 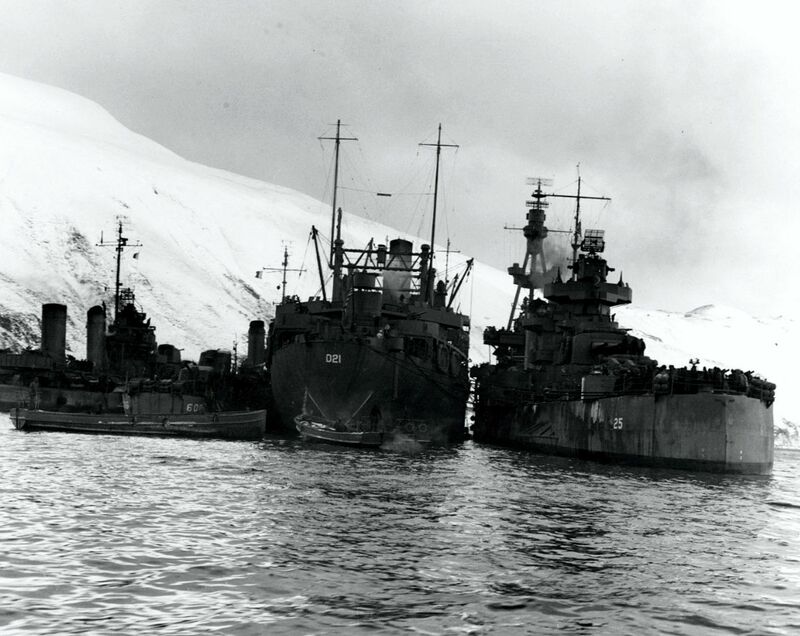 USS Salt Lake City (CA 25) alongside USS Markab (AD 21) at Dutch harbor Alaska on 29 March 1943. 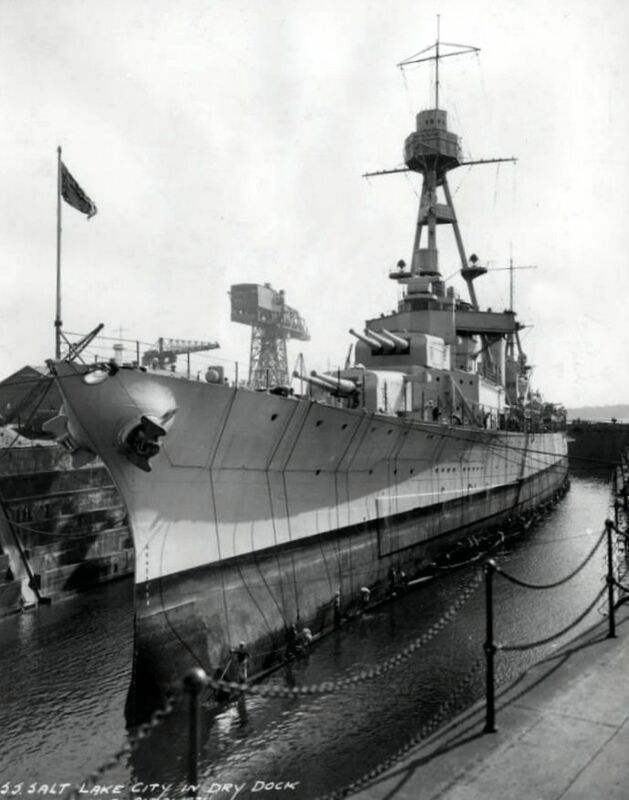 The cruiser is being repaired after being damaged in the Battle of the Komandorski Islands three days earlier. 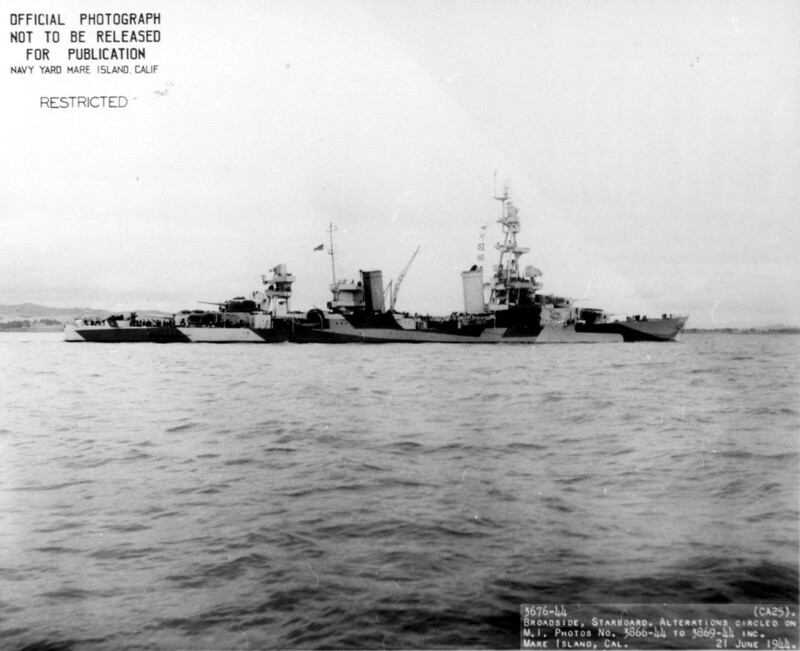 At left are the USS Coghlan (DD 606) and another unidentified destroyer. 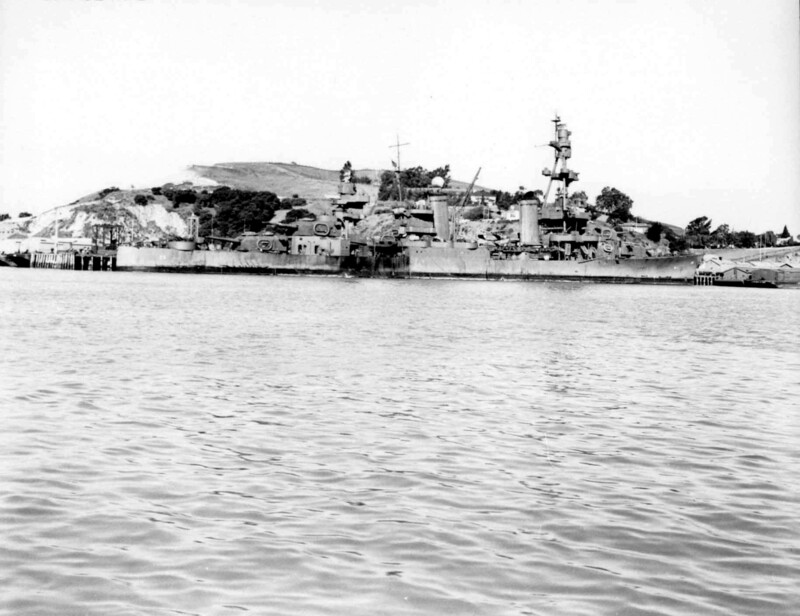 Amidships view of the USS Salt Lake City (CA 25) at Mare Island Navy Yard on 10 May 1943. 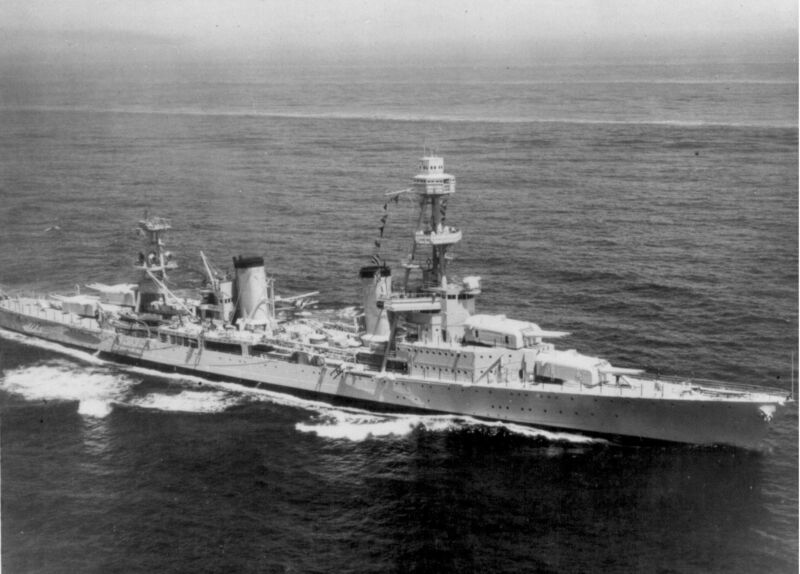 Destroyer to the right above the aft funnel is USS Anderson (DD 411) and there are submarine hull sections to the right of the forward funnel. 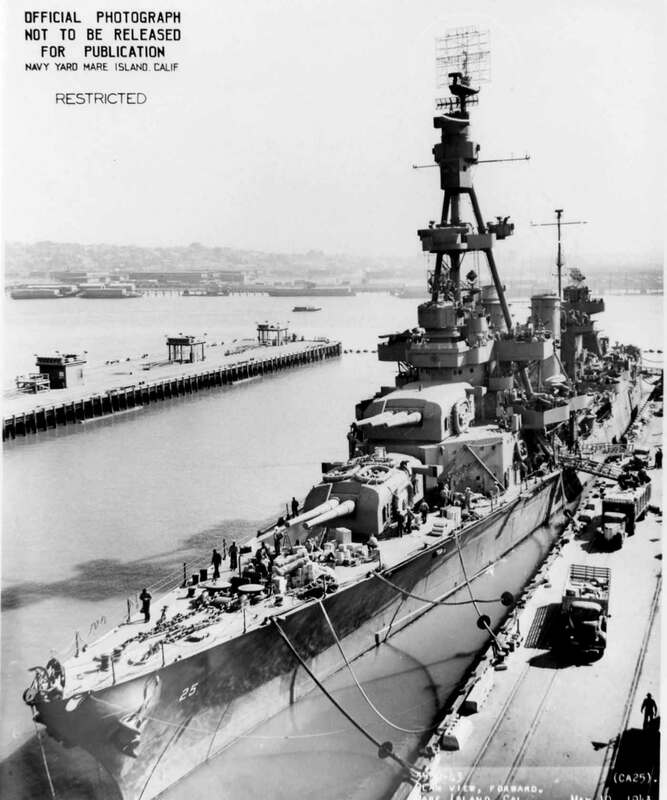 Forward plan view of the USS Salt Lake City (CA 25) at Mare Island Navy Yard on 10 May 1943. 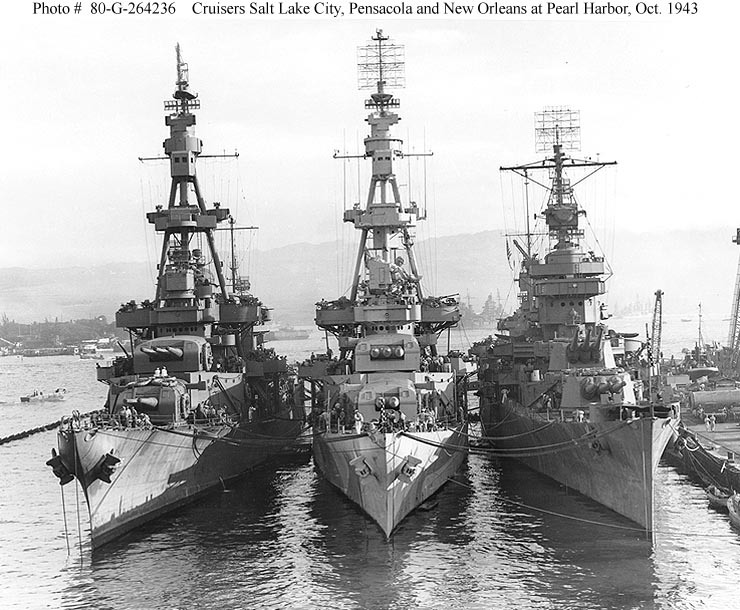 USS Salt Lake City (CA 25), USS Pensacola (CA 24) and USS New Orleans (CA 32) (listed from left to right) Nested together at Pearl Harbor, 31 October 1943. 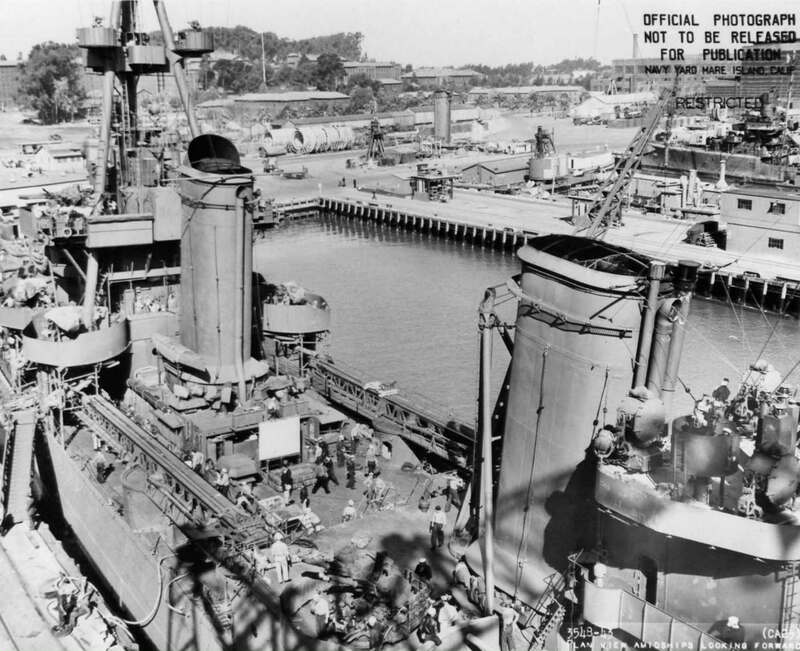 Ford Island is at the left, with USS Oklahoma (BB 37) under salvage at the extreme left, just beyond Salt Lake City's forward superstructure. 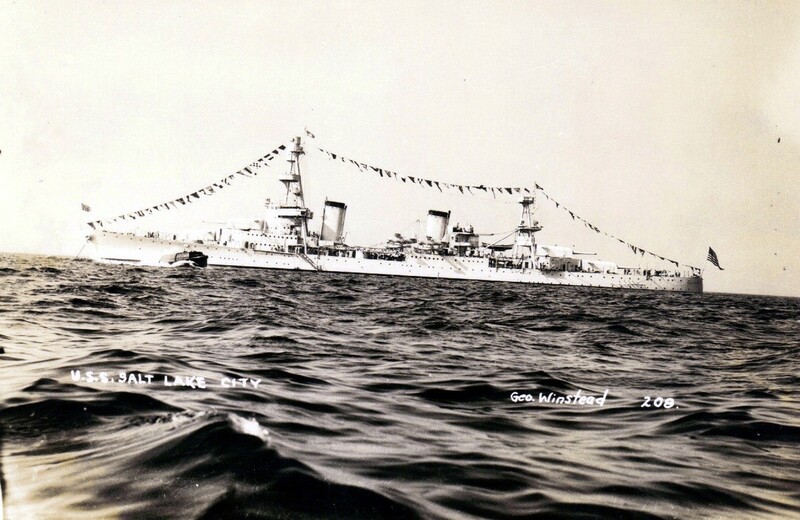 Note the radar antennas, gun directors and eight-inch guns on these three heavy cruisers. 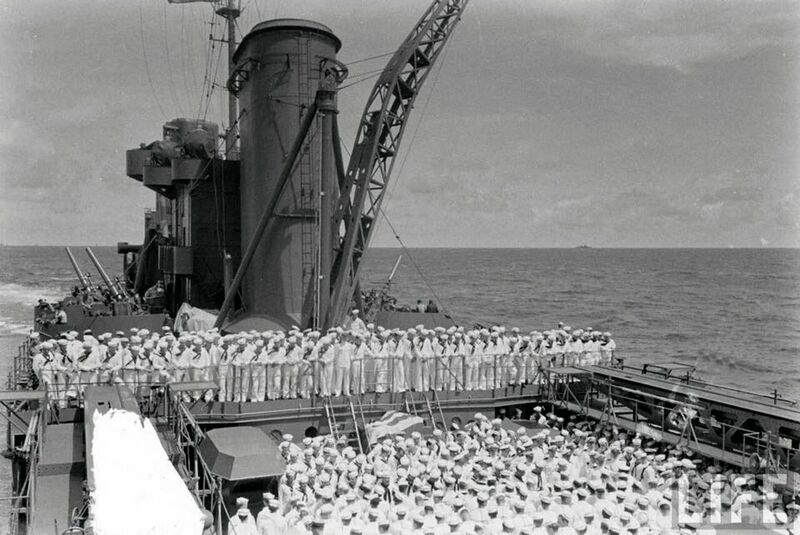 Official U.S. Navy Photograph, now in the collections of the National Archives #80-G-264236. 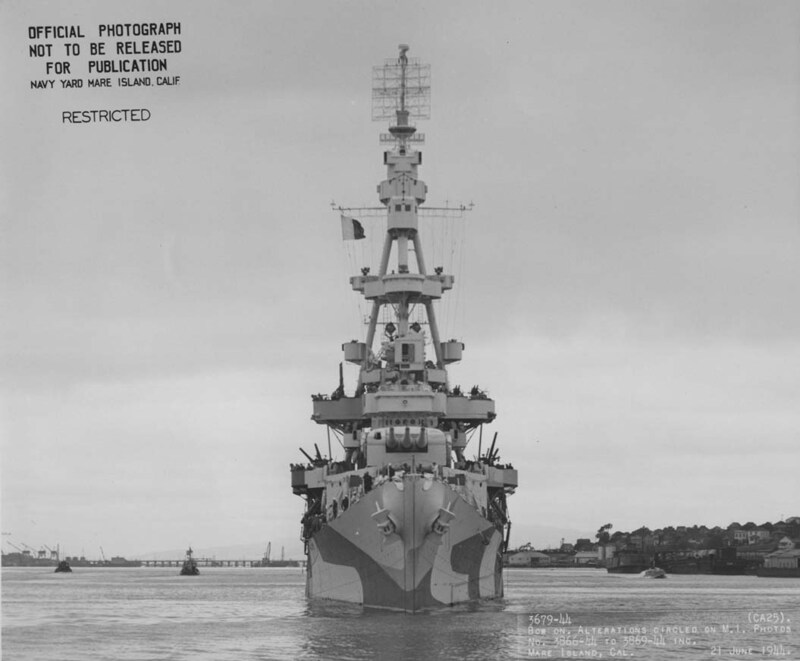 Port broadside view while underway off Mare Island Navy Yard, 21 June 1944. 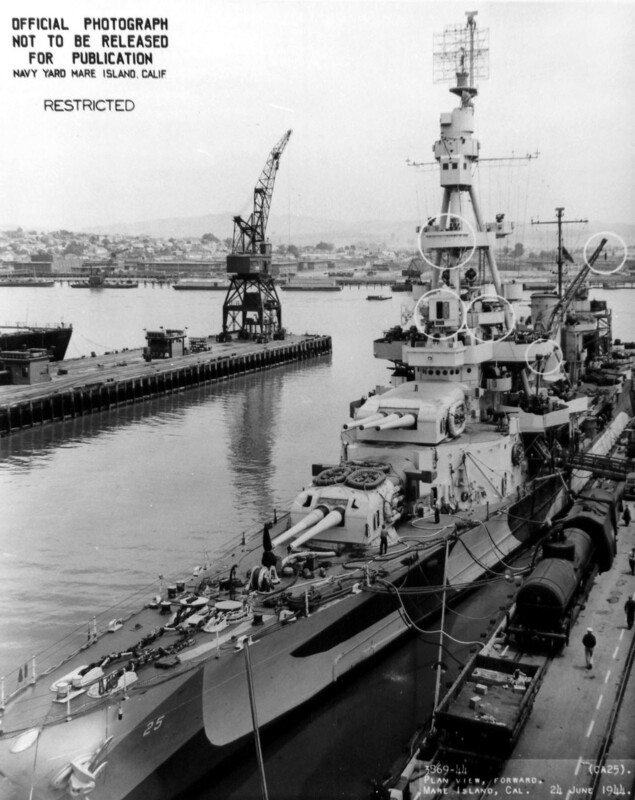 Bow on view while underway off Mare Island Navy Yard, 21 June 1944. 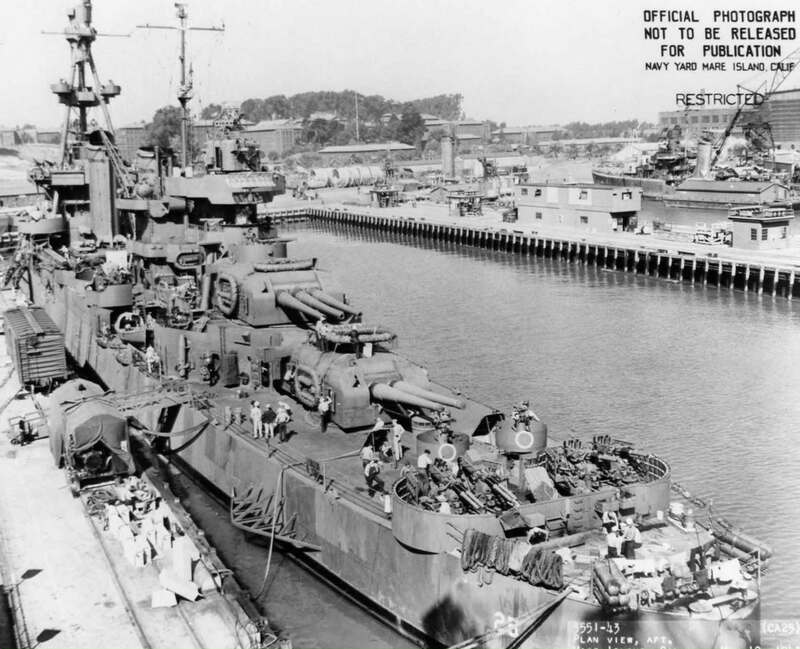 Forward plan view of USS Salt Lake City (CA 25) at Mare Island on 24 June 1944. 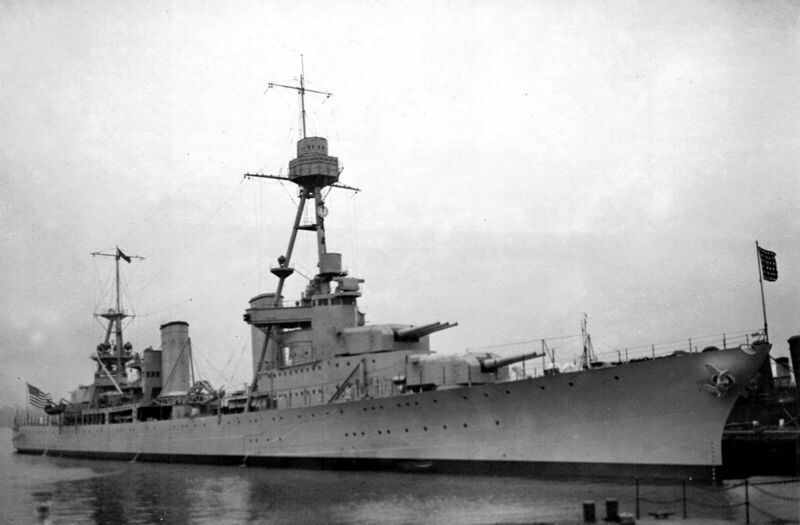 She was in overhaul at the shipyard from 6 May until 27 June 1944. 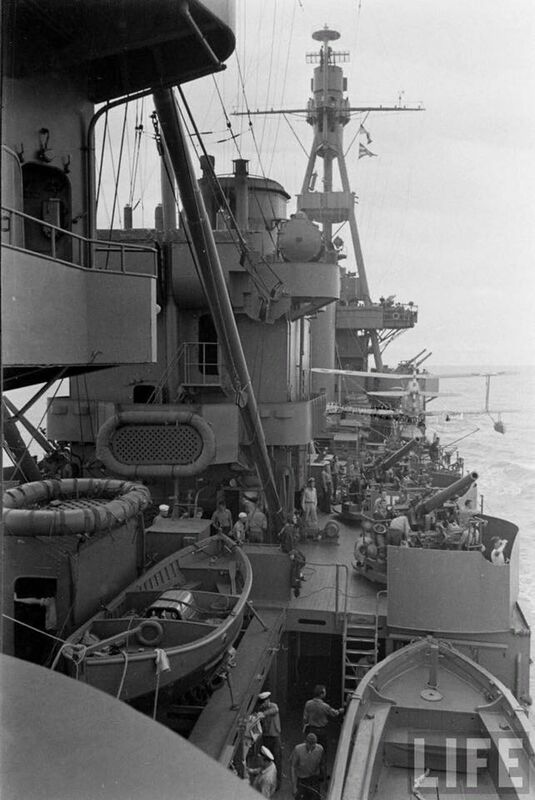 Amidships looking aft plan view of USS Salt Lake City (CA 25) at Mare Island on 24 June 1944. 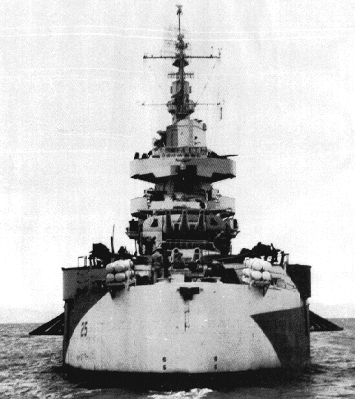 She was in overhaul at the shipyard from 6 May until 27 June 1944. 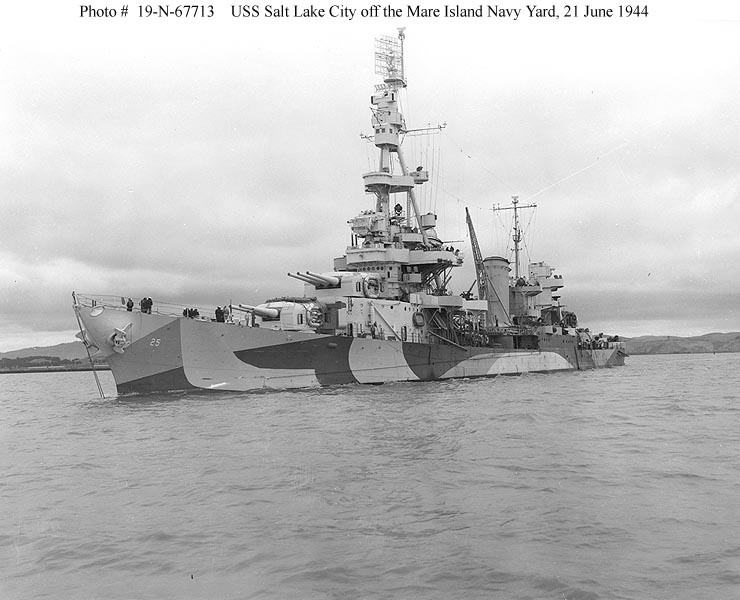 78k USS Salt Lake City (CA 25) off the Mare Island Navy Yard, California, 21 June 1944. 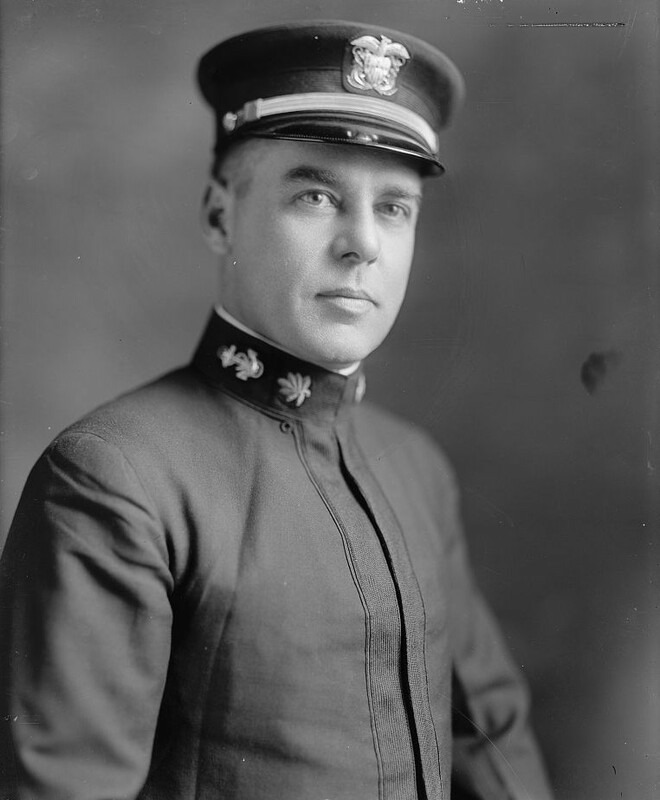 Photograph from the Bureau of Ships Collection in the U.S. National Archives #19-N-67713. 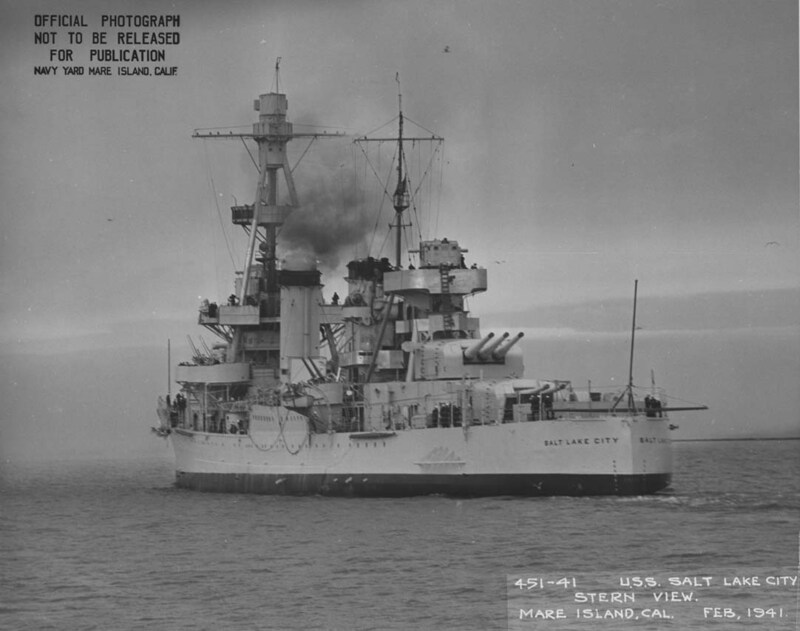 Broadside view of USS Salt Lake City (CA 25) off Mare Island on 21 June 1944. 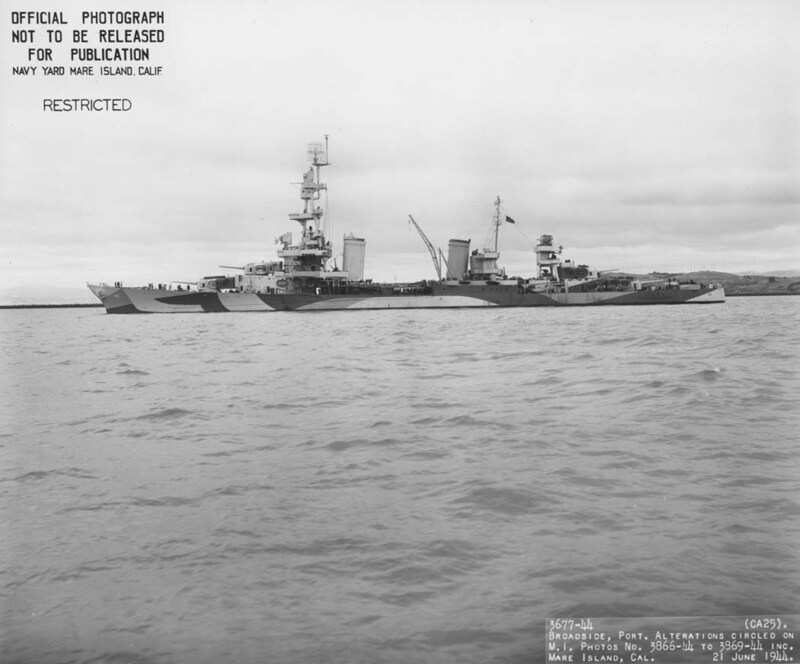 She was in overhaul at the shipyard from 6 May until 27 June 1944.
ex-USS Salt Lake City (CA 25) being sunk as a target, on 25 May 1948.
ex-USS Salt Lake City (CA 25) sinking after suffering gunfire damage on 25 May 1948. 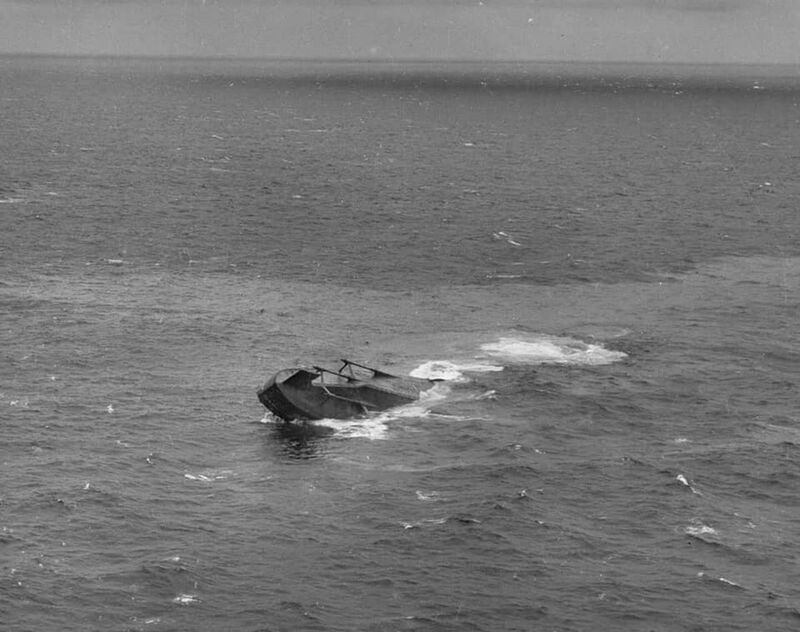 The ex-USS Salt Lake City (CA 25) capsizes after being used as a target vessel on 25 May 1948. 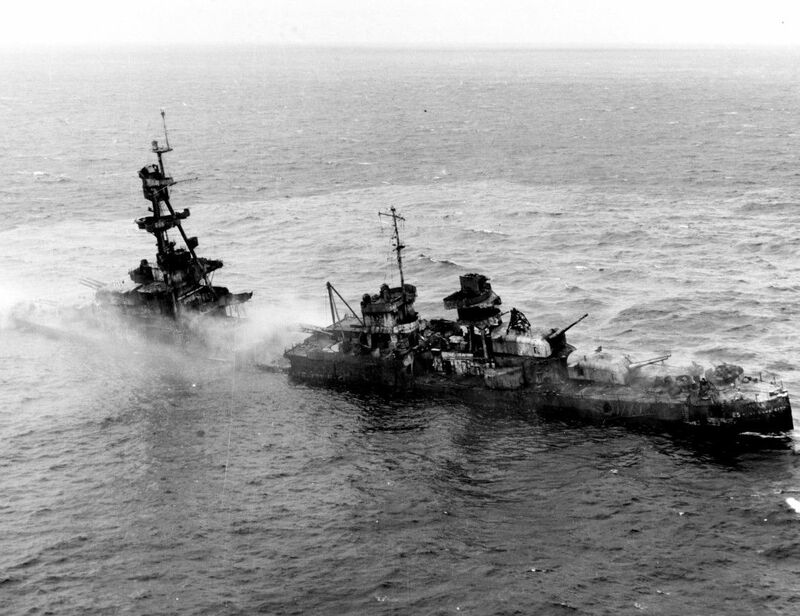 Last moment of the ex-USS Salt Lake City (CA 25), as she is sunk as a target off of San Diego on 25 May 1948. LIFE Magazine Archives - John Florea Photographer, shared by Peter DeForest. 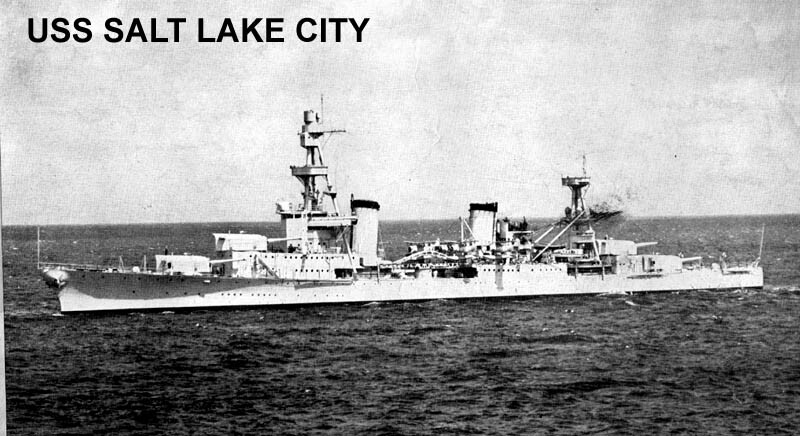 History of the USS SALT LAKE CITY CA-25 By Sandy Eskew as told by various members of the crew.